The elegant heart of the kingdom. The Mushroom Kingdom is the fifteenth kingdom visited in Super Mario Odyssey. It is the greater location of Peach's Castle, which is based on its design from Super Mario 64, sharing a similar layout (including the castle grounds, first floor interior, and courtyard), with the music of the interior being rearranged as well. The kingdom itself contains multiple references to Super Mario 64, with many of them taking the form of Power Moon requirements. The Mushroom Kingdom can be first seen by traveling through a painting in the Luncheon Kingdom, which leads to Yoshi's House on a floating platform away from the main area. 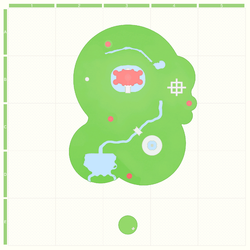 The rest of the area cannot be explored until after rescuing Princess Peach from Bowser in the Moon Kingdom, after which the Odyssey can fly to the kingdom. Power Stars take the place of Power Moons in this kingdom, though they are still referred to as Power Moons when collected, and they resemble regular Power Moons when loaded onto the Odyssey. You'll always know whose castle this is. 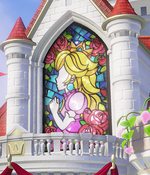 Because Princess Peach is so often absent from her kingdom, her citizens took it upon themselves to create a stained-glass portrait of her on the castle balcony. While a pale reflection of the genuine article, the portrait brings comfort to the citizenry when their princess can't be with them. Less "art storage" and more "art prison." In older times, the towers dotting the landscape here were watchtowers. Now they hold and preserve a series of mysterious paintings. These incredibly detailed works are so real that admirers speak of being pulled into another world by the paintings. However, it's extremely rare for tourists to be permitted to see them, due to some undescribed danger, and casual visits are discouraged. An image of the national attitude. The Toads of the Mushroom Kingdom value their relaxation and have created several lovely spots on the castle grounds for that purpose. Neither too small nor too large, and with just the right amount of ornamentation, these plazas and courtyards exemplify the best traits of this kingdom. A bit more dangerous than it looks. A bit. Even the serene Mushroom Kingdom has its more dangerous locales. 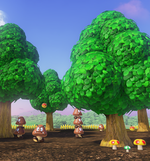 This forest was originally planted for mushroom cultivation, but while the mushrooms have flourished, a large number of wild Goombas have also moved in. While it's come to be known as Goomba Woods, it's still a pleasant place for a stroll, so if you're not afraid of these fearsome beasts, why not treat yourself to a walk? Not very deep, so a good place to swim. These fruit thrive in the warm climate here and are a favorite of many creatures that reside in the Mushroom Kingdom. 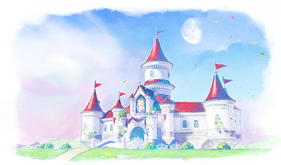 Visit Peach's Castle, the face and heart of the kingdom. Relax in the various soothing spots scattered about. Stroll through the rolling hills and dales of the castle grounds. Mario Picture Match Mini Rocket East of Goomba Woods An area with a Picture Match minigame. Mario must assemble cardboard parts of his facial features to closely match the original picture. Courtyard Locked door guarded by a Toad On the steep slope leading to Goomba Woods An exact recreation of the courtyard from Super Mario 64, where Mario must open all eight treasure chests scattered throughout to obtain a Power Moon, as well as throw and spin Cappy onto a glowing spot on top of the fountain to obtain another Power Moon. Mario can only access this area while wearing his Mario 64 or Metal Mario set. The Sea of Clouds Warp Pipe At the main river's source A platforming area among a sea of clouds composed of colorful block-like structures and seesaw-like lifts, where Mario must capture Yoshi and help him eat all of the berries scattered throughout the area to obtain a Power Moon while avoiding the Maw-Rays that emerge from the clouds. This area must first be accessed by eating the berry blocking the Warp Pipe as Yoshi, who is found on top of Peach's Castle. Moving 2D Area Well West of Peach's Castle An 8-bit area composed of moving walls and spinning platforms. Mario must remain within these walls at all times while avoiding the Bullet Bills and Fuzzies throughout the area. If he falls out of these walls, he will fall into the void below and will have to restart this area. Enemies marked with an asterisk (*) are only found in bonus areas, while the non-boss enemies marked with a caret (^) are found during the boss rematches. There are eight paintings in this kingdom, six of which are boss rematch paintings while the other two are warp paintings. There are two warp paintings. One is located near some trees next to the Odyssey. It can lead the player either to the Snow Kingdom Clifftop at the Snow Kingdom or the Diving Platform at the Seaside Kingdom, and can be used at any time. The other painting is found at Yoshi's House and can be only accessed from a painting at Luncheon Kingdom. There are six boss rematch paintings. Knucklotec's painting is located inside a tower at the west of the kingdom, Ruined Dragon's painting is located inside a pipe under the castle's moat blocked with a Berry that only Yoshi can eat, Mechawiggler's painting is inside a tower at the north of the kingdom, Torkdrift's painting is inside a tower that can be accessed by climbing a vine, Mollusque-Lanceur's painting is located at a pipe under the moat where Dorrie is, and Cookatiel's painting is located at a tower next to where Dorrie is. The Mushroom Kingdom has star-shaped Power Moons. There are a total of 116 Power Moons (98 regular Power Moons and 6 Multi Moons) to be found in the Mushroom Kingdom, more than any other kingdom in the game; 61 of these moons are obtained by completing achievements for Toadette. There are a total of 100 regional coins to be found in Mushroom Kingdom, which take the form of Super Mario 64's star-stamped coins. They also resemble the Purple Coins found in the Super Mario Galaxy games. 3 coins: On the roof of a house just west of the path. 2 coins: On top of a tree at south end of underground passage. 3 coins: Cliff's edge - non-grass path near Toad shepherd. 3 coins: Inside Peach's Castle behind the throne. 3 coins: Near the edge of cliff - next to well. 3 coins: Near edge, northeast of garden. 3 coins: Next to river - right before the waterfall. 3 coins: Behind building above the woods. The eight chests in the hidden replica of Super Mario 64's castle courtyard correspond to the starting positions of the eight Boos found in the actual courtyard in the original game. When opening these chests in the correct order, the final chest is located on the starting position of the Big Boo holding the cage that leads to Big Boo's Haunt. The two 2D Power Moons in this kingdom resemble regular Power Moons and make the normal 8-bit version sound of obtaining a Power Moon, rather than the Super Mario 64 sound. The Multi Moons obtained from the boss rematches also appear as a trio of Power Moons, rather than a trio of Power Stars. This page was last edited on April 22, 2019, at 01:04.